"Anyone interested in piano pedagogy or great piano teachers ... will find this book a fascinating and instructive read by simply opening [it] up to any page. ... Highly recommended." "An astonishing book ... it serves as a brilliant condensation of ... fascinating insights into the lifetime and lifestyle of this deep-thinker into all matters pianistic." 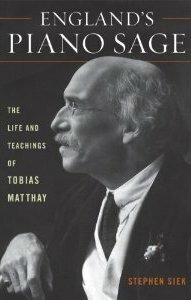 "Stephen Siek has written a defining work about Tobias Matthay, a valuable addition to any piano library. At a time when the piano world is changing rapidly, Siek's detailed research into the late Victorian musical world in London is enormously readable, and places Matthay's evolving theories about piano art in context to the musical world of his times." "An important chapter in the history of the piano is now rescued, told with charm as well as scholarly rigor. ... Stephen Siek has accomplished something admirablea fascinating and very readable book." "Siek is brilliant in synthesizing and clarifying ... The wealth of information in this book, the examples of Matthay's piano works, and the samples of his many writings make this required reading for anyone who teaches piano and is interested in an important era of music. ... This book is an extraordinary resource for pianists and cultural historians." "Siek has written an informative tour d'horizon of British music making from the Victorian period through the early twentieth century, and I can't think of another book that does an equal job of bringing this era to life. In short, I think it has 'legs' and should appeal to many more than just those who are already devoted acolytes of Matthay." "For those interested in the development of methods of piano teaching, as well as in Matthay as a person, this is a book that incites admiration and respect. It is definitely inspiring and sometimes moving." "Scarecrow Press have produced an impressive volume. ... This book ... will encourage me to explore the legacy of his pupils with greater interest and understanding. For someone who majors in performance technique this book is a treasure trove. There is also much to interest the specialist of English music: Matthay's compositions for piano and orchestra are explored in some depth. ... Siek has done much to situate Matthay back into the fabric of 20th century British musical history. He allows the reader to feel immense warmth and sympathy for a man who many have never heard of, or, like myself imagined as a frosty pedagogue in his ivory tower."